Highest output 1,006,079 tons (second 1 million) in 1968-1969. Pumping was discontinued but the shafts were kept open to monitor the anticipated rise in water level. E442740 N366608. Second Waterloo 3’ 0” (0.91m) - Mar 1970. At the time of sinking it was the deepest pit in the basin at 550 yards (503m). 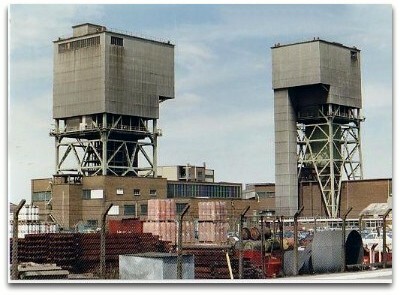 It was sunk on the site of an old colliery of the 1800s and Ling’s colliery was abandoned to dewater. Underground water collected from various sources was pumped to the surface at an average of 1,023 gallons per minute in 1990 and the total amount for the year was 537,690,000 gallons. Pumping was continued after closure to protect Silverhill as it was found that shutting off the pumps previously at closure after overflowing in the Tupton seam water was found issuing from a stopping in Silverhill Low Main (Tupton). In 1937 40% of the 11acre shaft pillar was extracted successfully. 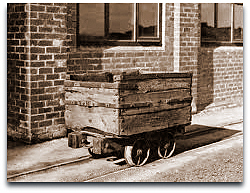 8cwt wooden tubs as shown were used in the 1930s prior to 1 ton steel ones being introduced following a reorganisation in 1940. A new electric winder MB Wild was installed in 1940. New offices were built in 1941. A Tromp coal washing plant was used. At one time the brick making plant was producing 5 million bricks a year. New ideas were put into operation in 1951, first was an arc shearer for headings followed by a Joy loader. The Training centre was opened in 1952 with the offices at nearby Holmewood. Horses were used underground to 1954. A Gloster getter face machine was put to work in 1955. Pithead baths were opened in 1958. There were underground connections to Holmewood and Grassmoor. Williamthorpe and Holmewood were merged under one Manager in 1967 and a record output of 5,430 tons was turned in 24 hours. A new Sirocco fan was installed. 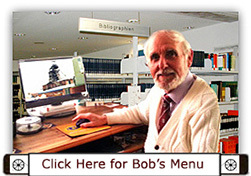 In 1969, 150 men over 60 years of age were forced into early retirement out of a manpower of 1,780. A Huwood power loader was installed. A training gallery was operational. New workshops built. The abandonment plans for the 2nd Ell, 1st Waterloo and Deep Soft seams were countersigned by Albert Wheeler (7349) on 1st July 1970, he was then transferred and the plans for the Yard seam by John H White (8350) newly promoted as Manager on 2nd July 1970. 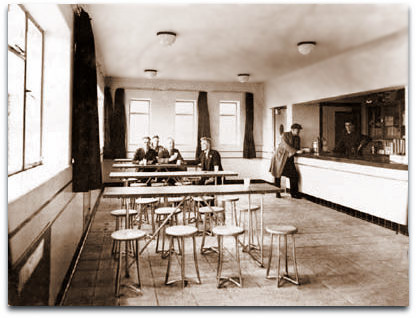 A view of the canteen is shown and views of the colliery before and after reorganisation. There was an inrush of water from old Avenue colliery when water erupted from the floor in the 2nd Piper from the Avenue workings below. The flooding hampered production for a time, whilst pumping was restored at Avenue 9 shaft. 1946: app 1,050 men and boys. 1969/70: 789,182 tons, 1,451 men. Len E Fletcher (3059) Group Manager 1966-1970. B George Stepney (5360) Agent Manager 1969 (for Williamthorpe/Grassmoor, transferred from Glapwell No3). John T Nicholson (8665) 1968-1970 (promoted to Manager Pleasley). John H White (8350) 1969-70 (promoted from Swanwick, promoted to Manager Glapwell). Arthur Frank Webb (1243) 1950-1970. Charles Smales (38) shotfiring accident 24/9/1968. It was hoped that Bevercotes (Nottinghamshire) would be back in production again in 6 months time after being out of action for 2 years. Unfortunately the pit struck geological problems soon after opening as well as shaft problems. A further problem was that a further 400 miners would be needed to boost the workforce to 1,000 in order to get the pit producing coal once more. 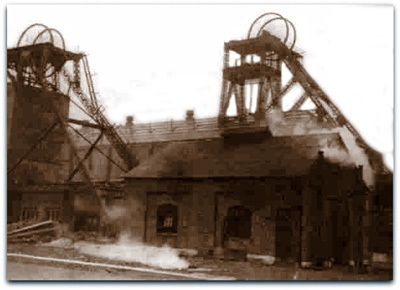 However most of the men transferred to other local collieries, mainly Bilsthorpe, Ollerton and Thoresby (Nottinghamshire) due to the closure, were settled in and would not transfer back.